Through the upper Incles valley, over the Incles pass and down to the Fontargent lakes, in a varied landscape full of contrasts, impressions and rich prospects. The lakes in their enchanting location form the visual highlight of the hike and give it a special character. Starting point is the Baladosa bridge, where the rivers Juclar and Manegor unite. It lies at the feet of a step in the terrain between the lower and upper Incles valley. At first, the way goes quite steeply uphill for a short time. Then it flattens gradually, approaches the Manegor river, and then leads almost horizontally between scrubland on the right and light coniferous forest on the left up the valley along the watercourse. 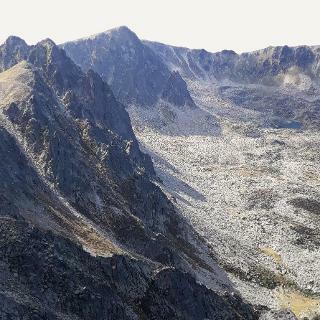 It leads to a plain of open pastureland, the Planells de Manegor, embedded between the rugged faces of the Anrodat massif on the west and the slopes at the feet of the Juclar ridge on the opposite side. There, almost the entire ascent path to the Incles (Fontargent) pass becomes apparent. With the meadows to the left, the path continues flat for a short distance along the river before gaining height again. 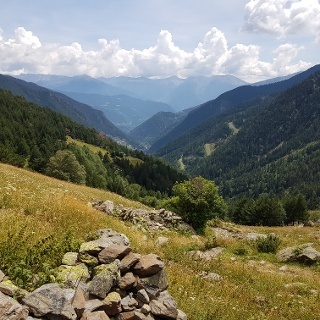 Accompanied by beautiful views back into the valley, it turns into a fairly steep ascent, which leads through grassy areas interspersed with stones and boulders. After a stretch of path with a slightly lower slope, the path then goes steeply uphill for a short time. 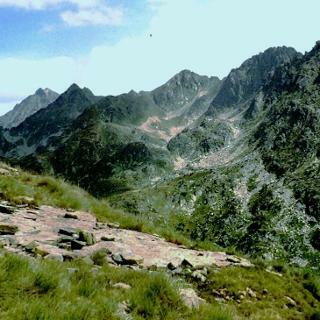 After that, the slope decreases, and the tour gently upwards across meadows reaches a broad mountain saddle with the pass marked by a cairn pyramid, between the Crete de la Cabane Sourde belonging to the Anrodat massif on the left and the Fontargent ridges belonging to the Juclar mountains on the right. Beyond and below the pass, between the spurs of the Anrodat and Juclar mountains, there is a high valley formed by the working of ice-age glaciation, which is sealed off to the north by a moraine barrier. 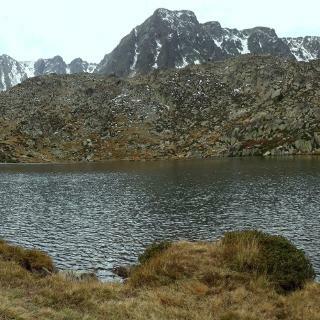 It is almost completely covered by the lower and largest of the three Fontargent lakes. The view extends across the lake and the adjacent middle lake to the west near its northern end. Lower summits of the mountain ridges located on the outskirts of the Pyrenees main chain emerge on the horizon. The tour now goes downhill, first on a short steep stretch of path, then with a moderate gradient through a rough and stony rock and scree terrain, and reaches the southern edge of the lower lake. There, the way turns into a narrow but pleasant path, which with a ridge to the left runs continuously and almost flat along the western shore of the lake or near the shore. After a short detour to the middle lake, which is at almost the same level and separated from the lower only by a small isthmus, the tour reaches the north end of the lower lake. There you have a wonderful view to the south, with, to the right, the imposing Crete de la Cabane Sourde peaks characterizing the landscape, the Fontargent ridges and the no less impressive Pic Negre de Juclar to the left, and in-between the pass with the lake extending to its slopes. The hike has no technical difficulties or dangerous spots. A certain level of surefootedness and prudence is required especially in wet weather. Hiking boots and weather-resistant clothing. Walking poles recommended. A compass can come in handy. There are no huts or other shelters on this tour. Depending on the prevailing general weather situation and the trail conditions to be expected, the hike can also be undertaken outside the recommended months, but not during winter. In the early autumn, from the end of September / beginning of October, first snowfalls can occur in the higher altitudes. Start and finish: Pont de la Baladosa, at the upper end of the Carretera de la Vall d'Incles (CS 270). From the car park back over the bridge, then turn right (Signposting: Port d'Incles, marking: yellow dots). There are also two more panels with information about further hiking possibilities and the history of the pass. After a short uphill turn left (Signposting: Port d'Incles). When the Riu Manegor is reached, continue along the river, ignoring a crossroads and continue straight towards the Incles Pass. Over the pass and further down to the lake. The markings are sometimes hard to discover, but the trail is consistently well recognizable. Continue along the lake, at the first fork to the left and in a few minutes to the middle lake. Then back to the way there, again along the lower lake to the northern end. Stay near the shore, circle the tip of the lake (past a very small, pond-like body of water and two small peninsulas) to a moraine hill above the lake outlet. There the way there ends. Occasional bar markings of the HRP and GRT long-distance trails are not relevant to this tour. Andorra itself can only be reached by long-distance buses, eg from Toulouse or Barcelona. A permanent, year-round bus service to the start of the hike does not exist. 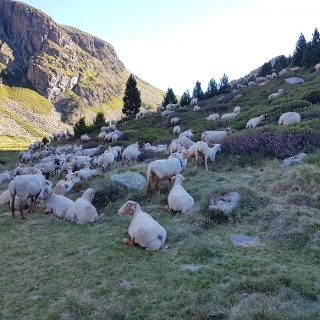 The inner-Andorran bus line L4 or L4 B between Andorra la Vella and Pas de la Casa has a stop at the lower entrance of the Incles Valley (name of the stopping point: Vall d'Incles, Numbers: 163 and 164), but is at about 3 km distance from the starting point of the hike. From the beginning of June up to and including the first week of September (time may vary slightly) the road is closed to tourist traffic during the day between 9am and 6pm. The connection between the entrance to the valley and the starting point of the hike is made by a full-day shuttle service with electric vehicles (as of 2018). Leave the Andorran national road CG 2, at approx. 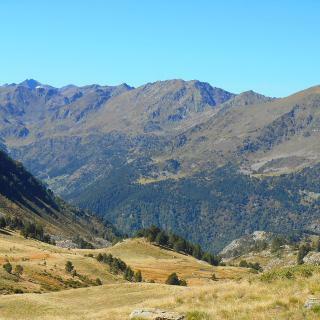 km 18 (between El Tarter and Soldeu) and turn onto the Carretera de la Vall d'Incles (CS 270) and drive to the end of the road where the starting point of the hike is. During high season, the road is closed during the day (see public transport, shuttle service). Two free parking spaces right at the starting point. The parking lot chosen for this hike is right after the bridge.